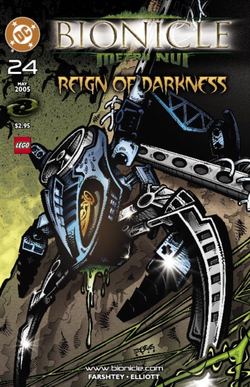 Shadow Play is the twenty-fourth issue of the BIONICLE Comic series, and the third issue of the Hordika saga. It is preceded by BIONICLE 23: Vengeance of the Visorak and is followed by BIONICLE 25: Birth of the Rahaga. Facts about "BIONICLE 24: Shadow Play"
This page was last edited on 12 January 2016, at 22:16.